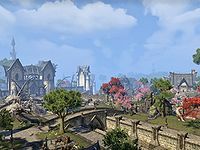 Firsthold (alternatively spelled First Hold) is the oldest, and still one of the most prominent, cities on Auridon, the second largest island of the Summerset Isles. Gleaming spires come into view when in sight of Firsthold. High cliff palaces of the ancient capitol, and the Abecean Sea, can be seen from the royal palace balcony. The cathedrals of Firsthold are devoted to Auri-El. The great river Diceto passes through the royal parks of the city where there are also hedge mazes. The gleaming spires of Firsthold, seen at dawn's light in the Firsthold Revolt, may be a reference to architecture similar to Alinor, which is described as "straight and glimmering" and that the towers are "designed to catch the light of the sun". Vanus Galerion, a Psijic of Artaeum, student of the famed Iachesis, and founder of the Mages Guild, first began operating out of Firsthold. Almost immediately after the guild was formed it had to hire guards, and the knightly Order of the Lamp was formed the following year. High Councilor and later Potentate Ocato of the Third Empire was born here. During the final years of the Third Era, Firsthold was under the rule of king Karoodil and queen Morgiah. Esta página foi modificada pela última vez à(s) 04h58min de 14 de abril de 2015.